Having carefully lowered my camera cases into the boat, a task sometimes made impossible due to the rising and falling of the sea, we then set off, my eyes fixed on that most iconic of sights, the ruins of village bay beyond. It was not however the empty streets of Hirta which fascinated me, but something more modern, something absent from the countless tourist images of the islands, and much less sympathetic to the surroundings; a Cold War military base. Instead of a structure hewn from local stone, the concrete and steel of a crumbling military installation are what first greet the eye of the visitor. Foremost among these is the unsightly but essential power station which keeps the modern St Kildans supplied with electricity, the one building which for obvious reasons rarely appears in the vast visual documentation of the islands. Coming ashore, the extent of the military base becomes clearer, with the long low buildings of the 1960s accommodation blocks, sergeants mess, and the rather Victorian sounding ‘ablution block’ sitting side by side with the more well known cottages and cleits. It is in many ways an uneasy balance, but one which has allowed St Kilda to thrive, with the efforts of National Trust work parties supported by that of QinetiQ, the company who run the military base on behalf of the Ministry of Defence. Turning my back on the base I looked out over the harbour, towards Dun, observing the strange spectacle of a bay full of yachts, tour boats and other pleasure craft. Hirta of course is a regular stopping point for a variety of cruise ships, and it is not unusual to find Village Bay thronged with tourists, wandering with guide books in hand around the ruins of the cottages, stopping to take self portraits, viewing the home and sometime prison of Lady Grange, and finishing the day by visiting the National Trust gift shop for a tea-towel or commemorative mug before boarding launches back to their ships. Deciding to go somewhere quieter, I sought to leave Village Bay behind entirely, with the intention of exploring the lesser known areas of the island such as Gleann Mor and the Amazon’s House, and to walk the ridge leading between Mullach Mor and Mullach Sgar, both hills crowned with radar stations which track live rocket firing from South Uist. It was from the vantage point of the hills above Hirta that the island began to show a different side, with the long grassy valley of Gleann Mor offering a sense of solitude largely absent from the busy working environment of Village Bay. It was also here I began to get a sense of the knife-edge existence that those who had lived on this island must have endured, with the exposed landscapes, sheer cliff drops down to the Atlantic below, and fragile rocky promontories adding to the sense of the dramatic. It would be to this place that I would often return on my visits to the island, slowly watching mist and cloud drifting in the valley before me, concealing and then revealing the vista below. It would be a year until I would next return to the islands, these images staying with me, the thoughts and feelings I had experienced slowly coming together in a way that made me want to respond to the environment, to document what I had seen and had felt. I had resolved to respond in a way which did not obscure the true St Kilda. I would document the military presence as well as the natural beauty of the islands, and the ruins of Village Bay, to show a more balanced view, something which in truth is still rarely seen. I would do this all with a battered medium format camera which had once belonged to the English landscape photographer Fay Godwin, whose work I would often return to as guidance and as a point of departure. The result is this book, a collection of images made over the course of several years and several journeys. They tell of days when the islands were bathed in a singular Hebridean light, or more likely completely obscured by clouds and mist. They are a journey around the archipelago, and are intended as a visual poem of the place rather than as a guide. For now they are the silent islands; quietly waiting, alone out in the North Atlantic, a place of austere beauty. 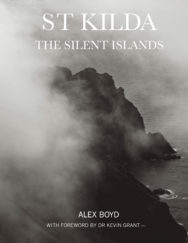 St Kilda: The Silent Islands by Alex Boyd is out now published by Luath Press priced £20.